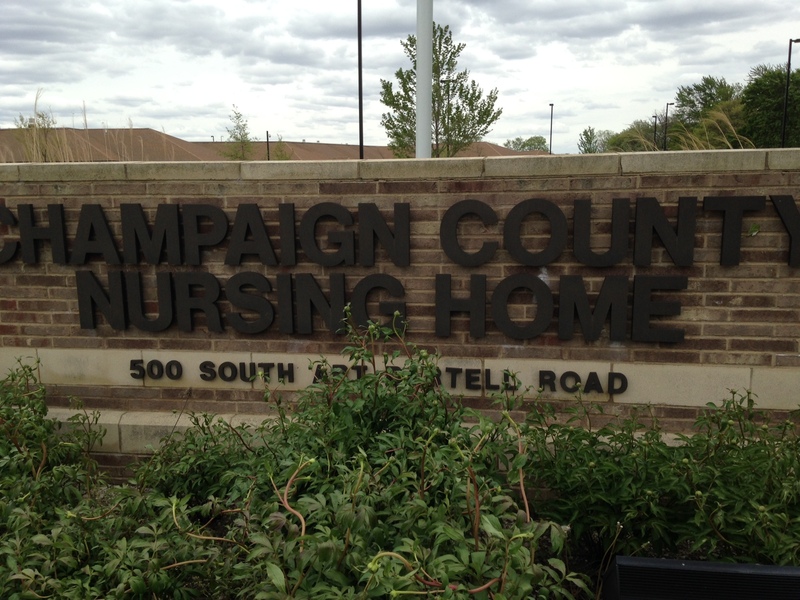 On Tuesday, April 4, voters in Champaign and Urbana voted strongly to support the Champaign County Nursing Home (CCNH) by voting for a modest increase in property taxes, and voting against giving the Champaign County Board authority to sell CCNH. However, turnout outside Champaign and Urbana was heavy due to contested Mayoral and Board seats, and voting there outweighed turnout in Champaign and Urbana, leading to an overall total against the property tax and for giving the County Board authority to sell the home. Continuing the fight to preserve CCNH as a public resource with health care access for the entire community, some County Board members and community activists are pointing to support for CCNH in Champaign and Urbana, while faulting low overall turnout and misleading information regarding finances and quality of care at CCNH for the election outcome. Voters in Champaign and Urbana clearly value the institution that has more than a hundred years of providing health care for the most needy residents of Champaign County. One of the tragedies of the decision made by voters was a mistake in the star rating made by the State of Illinois in grading CCNH. Opponents of CCNH seized on the mistake, as though the star system were as simple as rating hotels. Cathy Emmanuel, current member of the Nursing Home Advisory Board, describes the problem: “In the last publication of the five-star rating score for CCNH, there was a significant error in one of the three factors that determines that rating. The rating is based on the annual inspection score, staffing levels and quality measures. There was a data entry error by the state which understated the staffing hours for CNAs [Certified Nursing Assistants] by nearly 40%. The state corrected this after it was brought to their attention. The updated calculation and star ratings will be published in May and it is likely it will raise the star rating for staffing and may affect the overall rating. 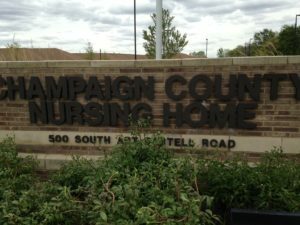 Less than a week after Champaign County voters made their decision on CCNH, the News-Gazette reported that in the first quarter of 2017, Gardenview Manor was cited with multiple serious violations by the Illinois Department of Public Health, for “a condition or occurrence at a facility that proximately caused a resident’s death.” Gardenview Manor was previously Vermillion County’s Nursing Home, sold in a decision by the Vermillion County Board four years ago. Staffing levels were immediately slashed. Although advocates for CCNH were repeatedly charged with using “scare tactics” regarding what happens when public nursing homes are sold, there is clearly a comparable example to what might happen to CCNH in our neighbors’ apparently troubled privatization experiment. In his February 2017 report commissioned by the County Board, Ron Aldrich recommended against selling or closing CCNH. He concluded that in the event that the Nursing Home was closed, “the needy and the ‘at risk’ populations would likely suffer the most,” or if it was sold, there would be “consequences for the needy and ‘at risk’ . . . if all long-term care providers were for-profit.” These conclusions came from careful examination of the population of CCNH and the skilled care options that are provided at CCNH. Mr. Aldrich pointed to factors which led to financial strain at CCNH: 1) The cost of construction and accompanying problems in building the current location of CCNH in 2005, which (unlike other County entities) are paid for out of the CCNH operating budget; and 2) the unusually long delay in Medicaid payments owed by the State of Illinois for services already provided by CCNH to residents of Champaign County. Real financial challenges at CCNH have been made even more severe by the repeated assertions that sale or closure are imminent. Decisions made by families are understandably changed by the perception of instability of an institution. So the current census numbers at CCNH are lower than they have been in many years. 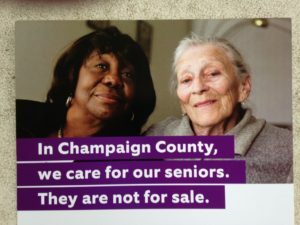 To allow the County Board to sell out seniors for the sake of expediency would dishonor the hundred-year history of this community providing care to the neediest of citizens in Champaign County. It will not be easy, but Champaign County Nursing Home can still find its financial footing as a public institution for the next hundred years. Michael Wilmore is currently Treasurer of CC-CARE and an AFSCME Staff Representative. This entry was posted in Nursing Home, seniors. Bookmark the permalink.